So this one definitely comes with a lot of pressure -- it's the one. The performance often considered the best of her career. And let me be frank -- what you've heard is entirely accurate. 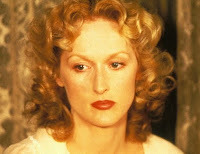 Meryl Streep is utterly fantastic in Sophie's Choice. From the perfect Polish accent to the nervous yet content facial expressions to the gut-wrenching penultimate scene, she's at the top of her game, and watching her is like a lesson in great film acting. And the rest of the film itself is nothing to sneeze at. It features the debut film performance from Kevin Kline, who is also captivating, but in severely different ways, playing Nathan, the quick-to-anger lover of Streep's Sophie. Add future Ally McBeal cast member Peter MacNicol as the innocent country boy Stingo, and you've got an enticing trio of stars headlining this well-constructed Holocaust drama. The reason this performance can truly be considered one of Streep's best, or even one of the all-time best, has to be in the astounding depth she brings to the character. This woman has been through hell and experienced life in a very specific and heartbreaking way. And Streep takes the character's experiences and upbringing and melds them with her general love of learning and life-living. Sophie isn't a victim, though she is constantly held captive by her past decisions. In order to see the true brilliance of Meryl Streep, one merely needs to get a look at the prolonged framed face shot of Sophie near the end of the film. As she recites her monologue, every twitch and every movement on her face says a mouthful. So though Sophie's Choice didn't manage a Best Picture nod (1982 was a tough year to crack the top 5), I'd be willing to question the Academy's decision. The movie has unshakeable performances, beautiful cinematography, a carefully adapted script from the William Styron novel, and well-placed costuming. It takes some work to make a heroine with so many flaws so mesmerizing in every scene. This one is a big credit to Ms. Streep's career, and thank goodness the Academy managed to see her through to one of her infrequent, much-deserved wins.